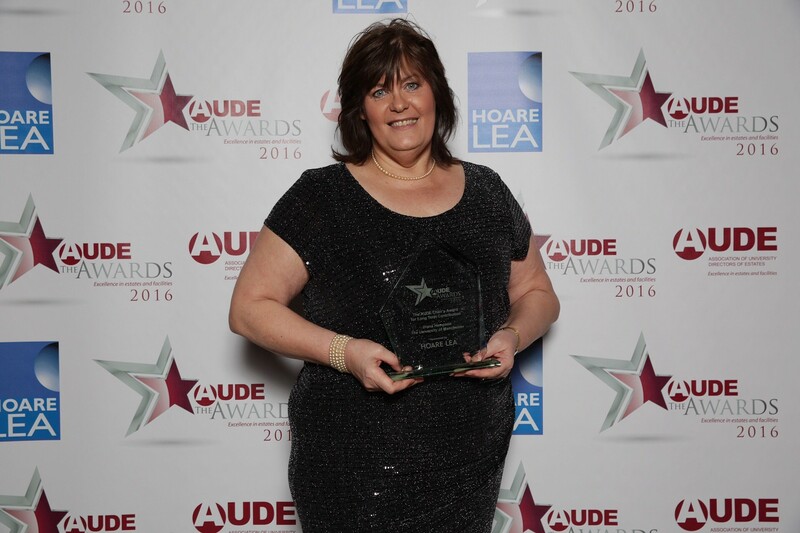 The 2016 Higher Education Estates and Facilities Awards took place at the Gala dinner on the final night of the annual AUDE conference held at Exeter University. Each year, the awards celebrate and highlight the achievements of universities and best practice in the industry, including those who lead the way in estate and facilities management. The judges were on the lookout for teams, projects and individuals who have made a significant contribution to enhancing excellence and ensuring university estates provide best value to support the institutional mission and promote efficiency and effectiveness. The awards provided an excellent opportunity to showcase sector achievements and allow everyone to see the very best practice taking place in institutions today. This year the AUDE University Impact Initiative of the Year Award went to The Consultants and Estates project team led by Neil Stubbs, Manchester University. This award recognises a specific initiative having a significant positive impact on the institution, the sector and/or the profession. The team at Manchester University impressed the judges with their innovative way of engaging with the community to deliver the impressive project of a 76,000m2 new build. When completed in 2019, it will provide a new campus for 8,000 staff and students in four schools and it is this extensive work on a large scale that won them the award. Highly Commended awards went to: The Campus Heart Project, Teeside University and The Community Project, Cumbria University. The AUDE Chair’s Award for Long Term Contribution went to Diana Hampson, University of Manchester (below). This award celebrates Diane’s long-term achievements within the higher education estates community. Director of Estates and Facilities at The University of Manchester for nearly 20 years, Diana has shown dedication and commitment to AUDE throughout her career and today leads the University’s 10-year, £1 billion Campus Masterplan to create some of the world’s most modern facilities for staff, students and visitors. 2016’s AUDE Emerging Talent Award went to Kelly Grimes, University of Liverpool for her exceptional work in redesigning the VfM data collection process at the University. She reinforced the positive VfM culture and ensured it remained an integral part of University business. This award celebrates her achievements and great potential for the future. Highly Commended awards went to: Amy Wilkinson, Durham University and Danielle Doyle, Edge Hill University. The AUDE Estates/Facilities Team of the Year Award was presented to the Swansea University Estates and Facilities Management Team for their exceptional work and amazing collaboration with the industry. They demonstrated excellent estate leadership within a multi-disciplinary commercial project, one of the largest and most significant projects in its 100-year history. The £450 million, one million sq ft, Science and Innovation focused Bay Campus relocated more than 30% of the University’s community and saw the institution operate across multiple campuses for the first time. Highly Commended awards went to: Queen’s University Belfast Energy Team and University of Hertfordshire Estates and Hospitality Team.